Snorkeling Cheeca Rocks is a real treat. The depths range from around 8 feet down to about 20. Perfect for snorkeling and freediving down to take some pictures. 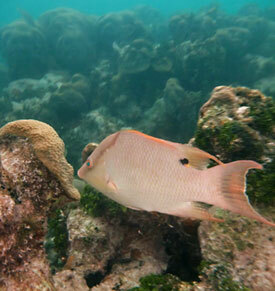 With a short boat ride from the Islamorada area you can access this patch reef. Because this reef lies about halfway between the keys and the barrier reef, you will often find that the water is "greener". It will have more algae growth in it and will generally not be as blue as the locations farther out. When we went it was slightly overcast and the water was pretty "green" and cloudy, but it was wonderful nonetheless. But you can definitely see in the pictures and video that visibility was not great. Really this location was much better than we expected it to be. 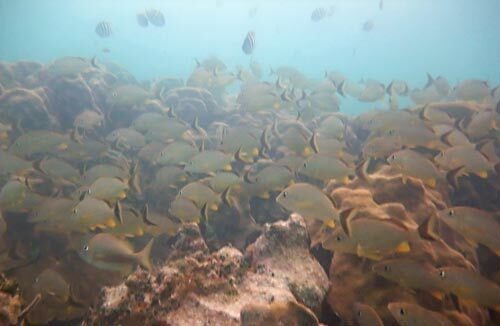 There were more medium sized fish here than at any place we have ever snorkeled. Tons of fish, in schools and solitary. From the moment we jumped in the water we were face to face with lots of fish. It was a surprise. We saw Hogfish, huge Green Eels, Bluehead Wrasse, lots of Grunts, Chubs & young Jacks, huge Parrotfish, including lots of Midnight Parrotfish, Queen Angelfish, Blue Angelfish, Foureye Butterflyfish, Gray Angelfish, and Blue Tang. 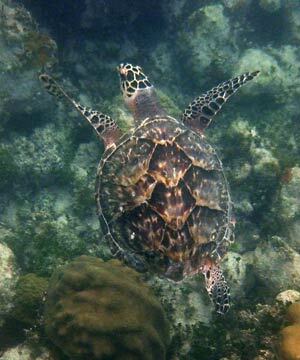 We also got to snorkel with our first turtles in the keys at Cheeca Rocks. We found one lively turtle that had a missing flipper in the back. It got around very well without it. 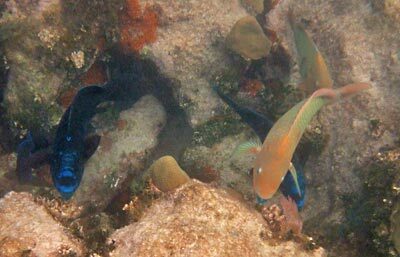 Besides the fish, the corals were also nice. 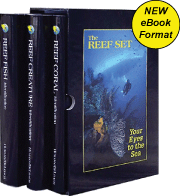 We saw huge Brain Corals, Star Corals, Lobed Star Coral, and Fire Corals. There was also a profusion of sea rods, fans and plumes. 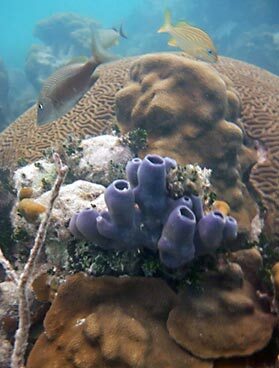 We also noticed a fair amount of sponges, including Branching Vase Sponges. We also saw some sea urchin - the West Indian Sea Egg variety. 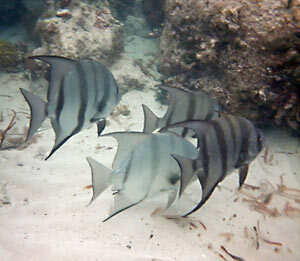 Below are some pictures of more fish we saw snorkeling Cheeca Rocks. 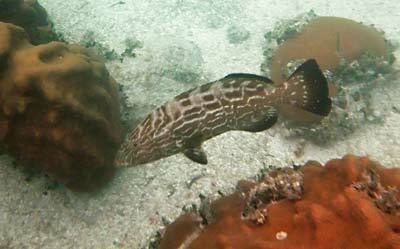 You can see a grouper, two types of parrotfish, and some Spadefish.